They’re eager, they’re observant, and they’re ready to learn – and they can’t wait to put on their thinking caps while out in the sunshine. Meet the Bow Valley’s newest crime scene investigators: students from Banff Elementary School! On a sunny spring morning in May, Grade 6 students each channeled their inner Sherlock Holmes. 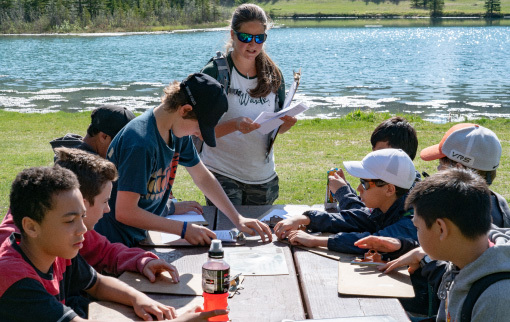 Heading out to Cascade Ponds in Banff for a day of adventure-based learning, they found a pretend crime scene and embarked on a crime-solving mission – and had a whole lot of fun along the way. Part of the school’s unique Nature Explorers program, this is one of a variety of unique excursions taking the classroom outdoors. 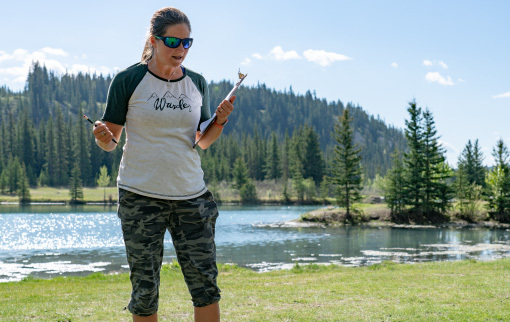 Offering an enhancement to traditional learning, it’s a hands-on, place-based learning experience focused on real-world skills, physical literacy, and appreciation for nature. Each excursion is specifically linked to the curriculum; from science and math to language arts and social studies. Setting the scene, students were asked to imagine themselves within a hypothetical situation. They were located at a small lakeside town in Northern Alberta. Here, police had received a call about a suspicious disturbance in the area, and it was time for the new detectives to put their skills to work! Among the first clues at the scene were footprints, handprints, blood splatters, and a pair of sunglasses. Taking in the hypothetical scenario, the students’ mission was to closely examine and describe the evidence in detail. Next, they needed to use critical thinking skills to decide which details were missing, source more information, then make an informed hypothesis with the aim of solving the mystery. “As detectives, every conclusion they make needs to be based on evidence. It’s an opportunity to think objectively and thoroughly like a scientist,” says Cristin Geestman, Nature Explorers Leader and the creator of the program – also known within the program as “Lynx”. To find the missing information pieces of their mystery puzzle, students were encouraged to send items from the scene to a hypothetical “laboratory” for fingerprinting and DNA testing, by request to Lynx. “It’s all about taking the curriculum outside and using critical thinking skills. We want students to learn to ask meaningful questions and analyse the world around them. So, to get the right information, they had to ask the right questions, then wait to receive ‘lab results’ before their making their hypotheses. 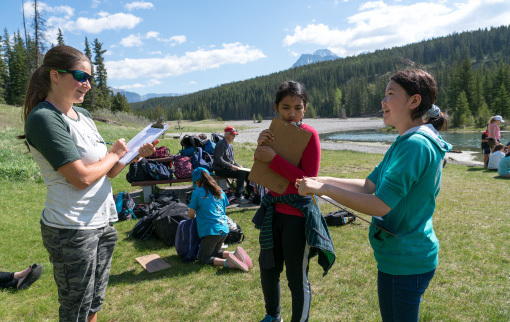 Not only is the Nature Explorers program unique to Banff, it’s also the first of its kind in Canada – and Lynx is delighted to see ongoing positive engagement with students, teachers and parents. Launched in 2011, the Nature Explorers program ran twice per month, with Grades 4-6 taking part once in fall and once in spring, mostly focusing on science. 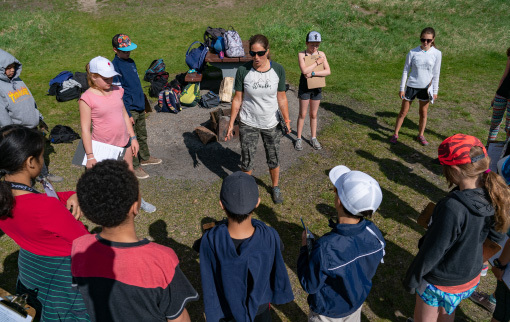 “In the first year, we went off the Alberta curriculum and thought, ‘How can we make this hands-on, and cross-curricular?’ We also integrated topics based on living in the National Park, such as being caretakers, following the Park rules, wildlife safety, and survival skills. Following great success in its first year, the program was extended in 2014 to the whole of Banff Elementary School, from Kindergarten to Grade 6. Since then, the program has been conducted outside every month for every class, also incorporating math, social, language arts, and art, as well as science. “Often, there are a number of connections between subject themes. For example, if you’re building a snow shelter, there’s connection to water, science and thermodynamics,” Lynx says. In Kindergarten, the program centres on using the five senses to explore nature. Then in Grade 1, it’s learning about habitats and the needs of animals. In Grade 2, it’s about the water cycle and the role of insects. Then Grade 3 moves onto geology, rocks, and minerals and the important role they play, and how the mountains were formed. Next, Grade 4 focuses on plants, how they grow, and the role they play in nature, plus pollution, decomposition, and natural versus human-caused waste. 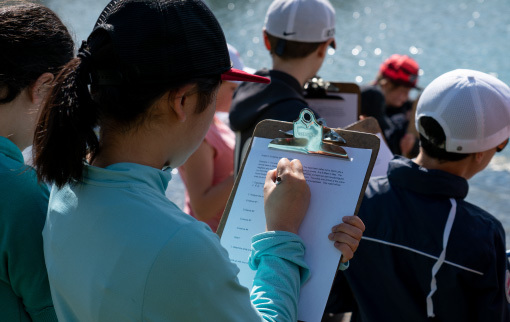 In Grade 5, it’s about wetland ecosystems, and identifying different species from birds and insects to animals and plants, as well as the non-living components of the ecosystem. Then in Grade 6, it’s this big forest study with evidence and investigation. While the program is designed to be fun and engaging, it’s about encouraging students to think critically – not just thinking about the “what”, but understanding the significance of the “how” and the “why”. “Over the years, the program has evolved as we’ve refined it from surveys and feedback from teachers and students. Teachers also share suggestions from what the kids are learning in the classroom, and come along to the sessions to remind students about concepts they’ve learned,” Lynx says. For the Grade 6 program, students had been learning about terms such as ‘hypothesis’, ‘evidence’, motive’, ‘means’, and ‘opportunity’, tying in closely with the detective-themed outdoor activities. Lynx says community connections and local support have been vital to the program’s success. “The program is funded entirely by outside donors, so it would not be possible without this vital funding. We are truly grateful to our supporters, with a special mention to the Pauw Foundation and Banff Lodging Company. We’re so excited to see the program go from strength to strength, thanks to our supporters, and of course, our wonderful students, teachers and volunteers,” Lynx says. To create a holistic program, Lynx has focused on building on the school’s existing community connections, and seeking out ideal places for each topic in the local area. The program also welcomes other experts to collaborate and share their knowledge, and welcomes parents to get involved with the fun. And what do the Nature Explorers themselves have to say? On the day of their detective excursion, we asked Grade 6 students Bri and Alice to share their thoughts. As budding Nature Explorers since their Kindergarten days, they have grown with the program and know it well – and their genuine enthusiasm makes it clear that these unique experiences make an impact. “I like that we’re always doing different stuff. It’s fun to take what we’re learning in class and go outside. Lynx makes up a lot of really fun games that show life cycles, and how to track and identify wildlife. My favourite year of all was Grade 3, when we learned about rocks,” Alice says. “It’s fun to learn about survival skills. We learned that there is a tree that you can use to cut rope, and there is a type of plant you can use to sew your skin up if you are hurt. And when you live in mountains, you have to be careful of animals like cougars and bears and elk. So we learned that when you see an animal, you never turn your back, you walk slowly backwards,” Bri says. No matter your age, it’s easy to see how this program is a seriously fun (and effective) way to learn. Here’s to more hands-on, authentic learning, and more time spent outdoors in this beautiful place we call home! 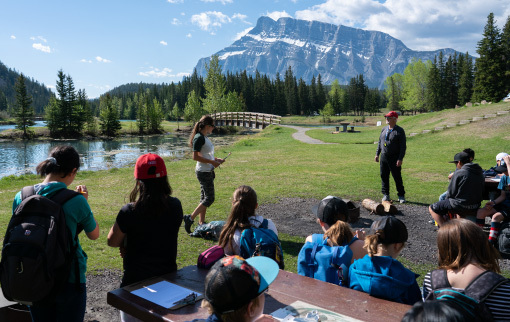 Banff Lodging Company is proud to support active education initiatives such as the Nature Explorers Program at Banff Elementary School, through community funding grants via its not-for-profit Pauw Foundation. The Pauw Foundation provides this financial support to local community organisations, sports clubs and local athletes, as part of its mission to promote an active and vibrant community in the Bow Valley. To find out more about the Pauw Foundation, including information about how your local organization or club can apply for a community funding grant, visit pauwfoundation.com.